When Bill 168 came into force in 2010, Ontario employers were required under the Occupational Health and Safety Act (OHSA) to devise, post, and implement a workplace harassment policy and workplace violence policy. 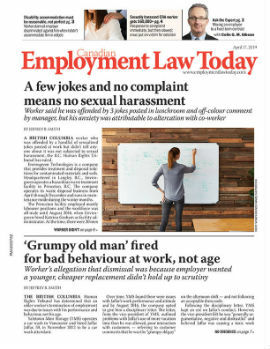 While Bill 168 specified an employer had a duty to take every reasonable precaution to protect its workers from workplace violence, the extent of an employer’s obligations with respect to workplace harassment remained murky. A recent Ontario Labour Relations Board decision — Ljuboja v. Aim Group Inc. and General Motors of Canada Ltd. — has clarified this lingering ambiguity. Peter Ljuboja was employed by Aim Group, a staffing agency based in London, Ont., and placed in a managerial position at a General Motors plant. One evening, as a consequence of being understaffed, Ljuboja reassigned a relief worker to the assembly line — leaving no one available to stand in when other workers took a washroom break. Jamie Rice, one of Ljuboja’s supervisors, chided Ljuboja about this reassignment during an end-of-shift meeting. While Rice was alleged to have “screamed” and sworn at Ljuboja, there was no allegation he threatened or attempted to exercise physical force. During a meeting the following day, Rice accused Ljuboja of having an attitude problem and inciting a fight.